Kate Middleton in Malene Birger! Royal Tour, Day 6 – Kate Middleton wears a non-British designer for the first time on the Royal tour! The Danish label “By Malene Birger” can be found at Leal! The Royal Wedding… and the Dress! Did anyone else wake up early this morning to watch the royal wedding like we did? How fun to see everyone arriving in their fancy clothes and hats! What a lovely way to start the morning! At Leal, we are completely in love with Kate Middleton’s wedding dress. Designed by Sarah Burton of Alexander McQueen, this beautiful gown effortlessly balanced tradition with modernity. The dress was made of white and ivory gazar covered with French and English Chantilly lace applique. The train of the dress was 9 feet long. Kate’s tiara was lent to her by the queen and was made by Cartier in 1936. 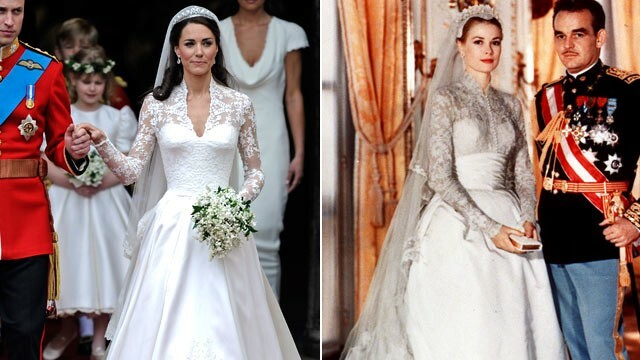 Many are comparing her wedding gown to Grace Kelly’s.